My Fun with Toddlers series includes crafts, games, songs, rhymes and books tied into a theme. 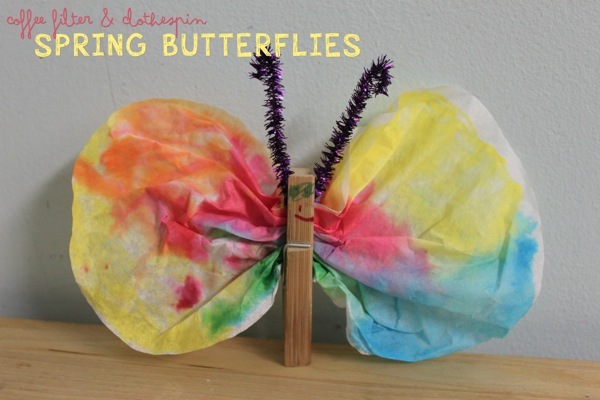 These can be used as lesson plans for a toddler class, preschool curriculum, or for parents to have fun with little ones at home. A beach or ocean theme offers lots of fun opportunities. Field Trips. If you live near a beach, go there! If there’s an aquarium nearby, go there. Or go to a pet store, what I call the “small animal zoo” to observe fish and other aquatic creatures. You may even find great tropical fish tanks at restaurants or in hospital lobbies. Ocean Sensory Bag. Get a gallon size ziplock (freezer bags are even sturdier than regular bags). Fill it with water, or with blue shower gel or clear hair gel from the dollar store. Add plastic fish or shells or glass stones, then close the bag, and tape it closed. Set it on a table (or tape it to a window) and a baby or toddler can poke and prod at it, and the fishies “swim away” from their fingers. Photo is from For the Love of Learning. Sink and Float Experiments. 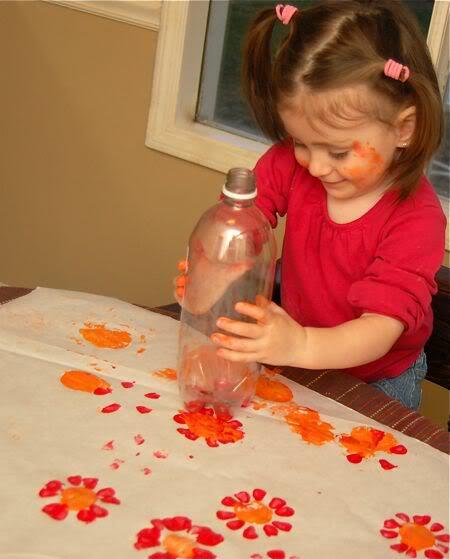 In the bathtub, or a large tub of water, let your child experiment with a wide variety of objects. What sinks? What floats? Help them notice any patterns (e.g. these metal things sink, these plastic things float). Explore Shells. Offer a collection of shells for your child to explore. Talk about their colors, shapes, textures. Count them. Sort them. Discovery Bottle. 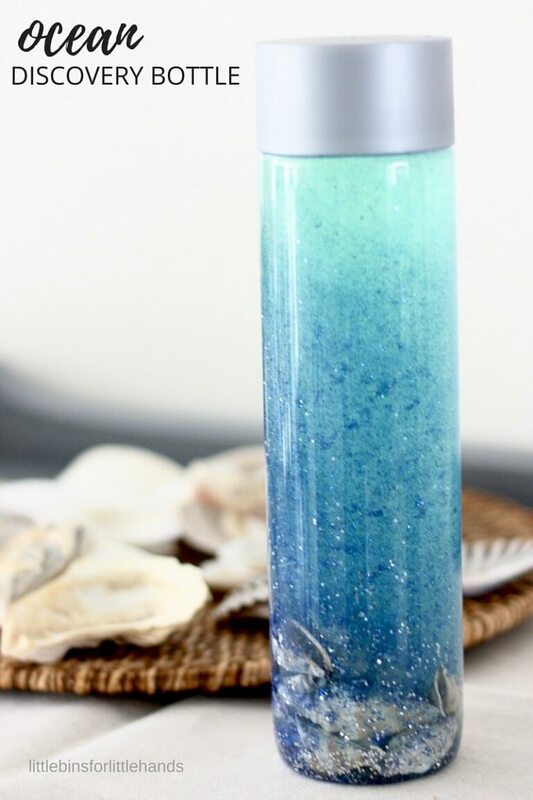 Fill a water bottle partway with water, add blue food color. Then add in either oil (mineral oil or baby oil are prettier, but any vegetable oil will do – see more pictures at Imagination tree) or blue glitter glue (like littlebins does). Then add seashells and/or plastic fish. Put on the lid and seal with tape or glue. Child shakes and observes. Beach Dough. Make play-dough with sand. Let your child play with it with their usual Play-dough Tools and add shells to mix in. Ice Excavation. Fill a container with water, drop in sand, shells, and plastic fish and freeze. Put it in a tub and give your child water to pour over it to melt the ice. (If your child won’t eat the salt, you can also give them a salt shaker to sprinkle salt on it to hasten the melting process.) Photos from littlebins. Ocean Foil Painting. Cover cardboard with aluminum foil. Squirt on a little green paint and more blue paint (glitter paint is especially fun). Give child q-tips or paint brush to smear the paint around. Let the painting dry overnight, then add ocean life stickers. Find a full tutorial and more pictures at newswithnaylors. Celery print fish. 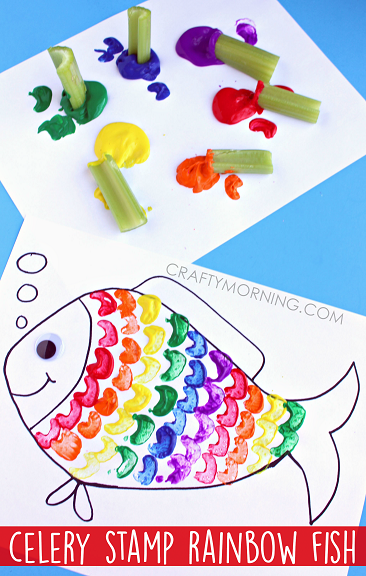 Give your child a fish shape cut from paper, paint, and a celery stalk. Show them how to dip the celery in paint, and press it to the paper to make fish scales. This image is from Crafty Morning. 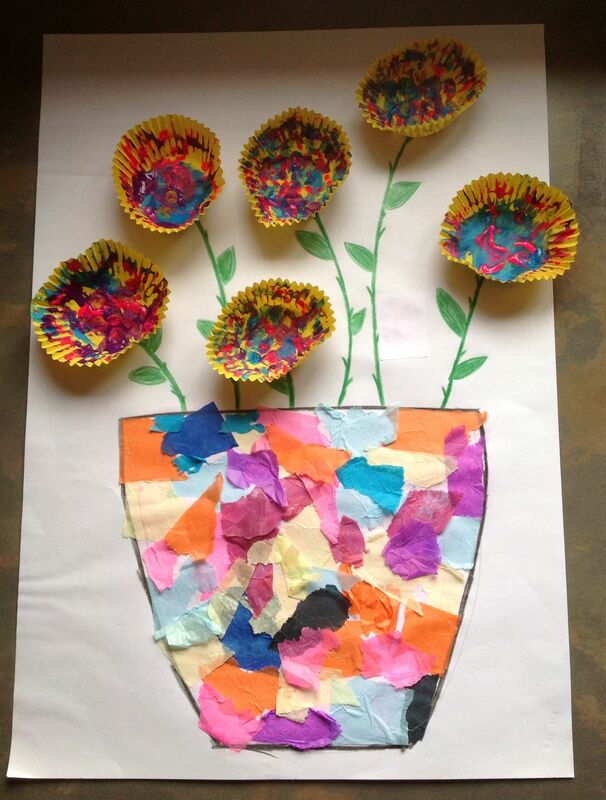 Your child’s art won’t be this pretty. 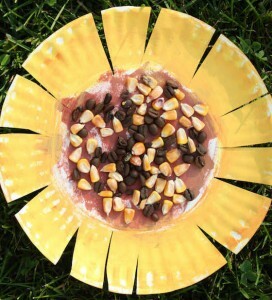 You could also do this on a paper plate to make a fish like a Little Pinch of Perfect‘s project. Ocean Suncatcher. Peel the backing off of contact paper, and place it sticky side up. 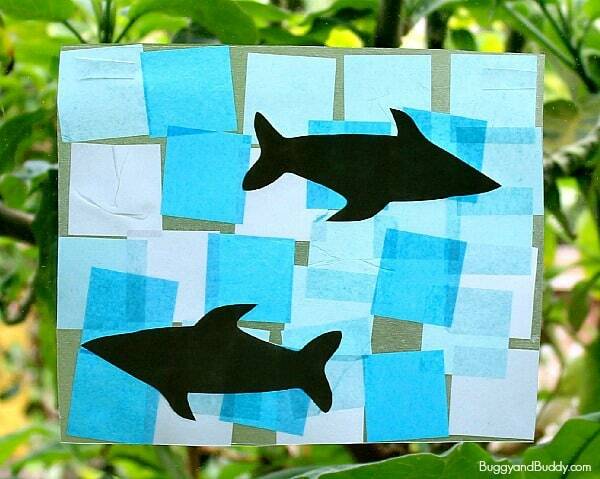 Give your child blue tissue paper squares and black ocean life shapes to stick on. When they’re done, seal it with another piece of contact paper and tape in the window. Images from Mrs. Plemon’s kindergarten and Buggy and Buddy. 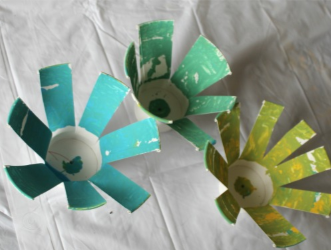 Coffee Filter Craft. 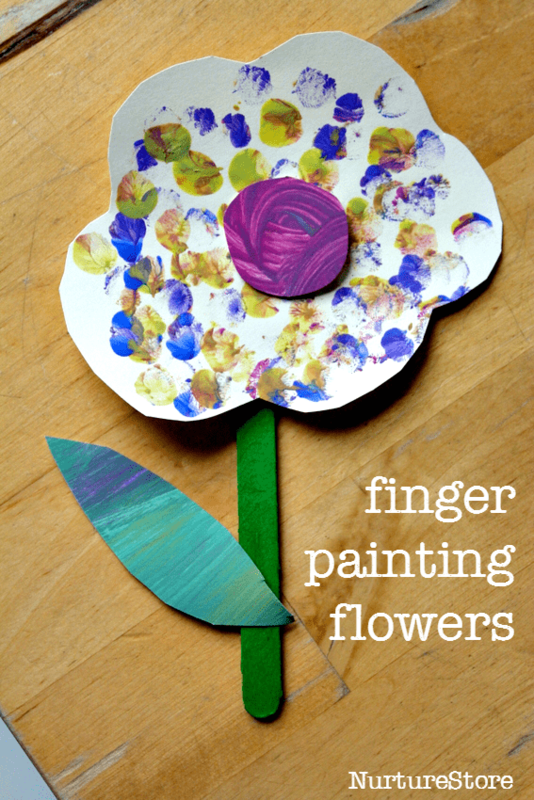 Give your child ocean colored liquid watercolors or diluted food coloring and a q-tip. They dip the q-tip in the color, then touch it to the coffee filter to decorate it. Idea from a little Pinch of Perfection. Paper Bag Jellyfish. 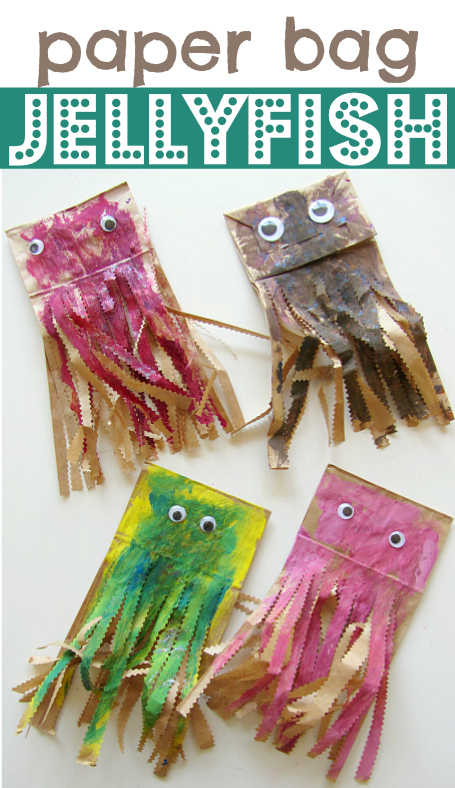 Child paints the paper bag, then you cut the tentacles and add a face. little fish, little fish, Gulp, gulp, gulp. Bigger fish, bigger fish, Swimming in the water…. Baby shark, Doot-doo, doot-doo-doo-doo Baby Shark! The fish in the ocean go swim, swim swim. Swim, swim, swim. Swim, swim, swim! The fish in the ocean go swim, swim, swim. All day long! One, two, three, four, five. Once I caught a fish alive. Six, seven, eight, nine, ten. Then I let him go again. Why did you let him go? Because he bit my finger so! Which little finger did he bite? This little finger on the right. Over in the Ocean: In a Coral Reef by Berkes and Canyon. A counting book-that-sings based on the “Over in the Meadow” tune, featuring gorgeous illustrations. Fish, Swish! Splash, Dash! : Counting Round and Round by MacDonald. A terribly clever design. As you read forward in the book, it counts up from one to ten. Then when you reach the end, you flip it over and count down from ten to one. Spot Goes to the Beach by Hill. Duck & Goose Go to the Beach by Hills. Ladybug Girl at the Beach by Soman and Davis. Honestly, just go to your library catalog… do a keyword search for “beach”, then narrow the search down to children’s books, and you’ll discover books from Curious George at the Beach to Paddington to Pete the Cat to Scaredy Squirrel… pretty much every series with more than a few books goes to the beach at some point. Here is a free printable handout handout you can share with some beach themed activities. For science themed activities for older kids related to the ocean, the beach, sink and float, check out my other blog, https://inventorsoftomorrow.com/. Or check out my Fun with Toddlers series for other themes, including: Pets, Zoo, Transportation, and the seasons. This entry was posted in Fun with Toddlers series, Play and Fun Activities and tagged beach, ocean, storytime, toddler activities, toddlers on October 16, 2018 by Janelle Durham. 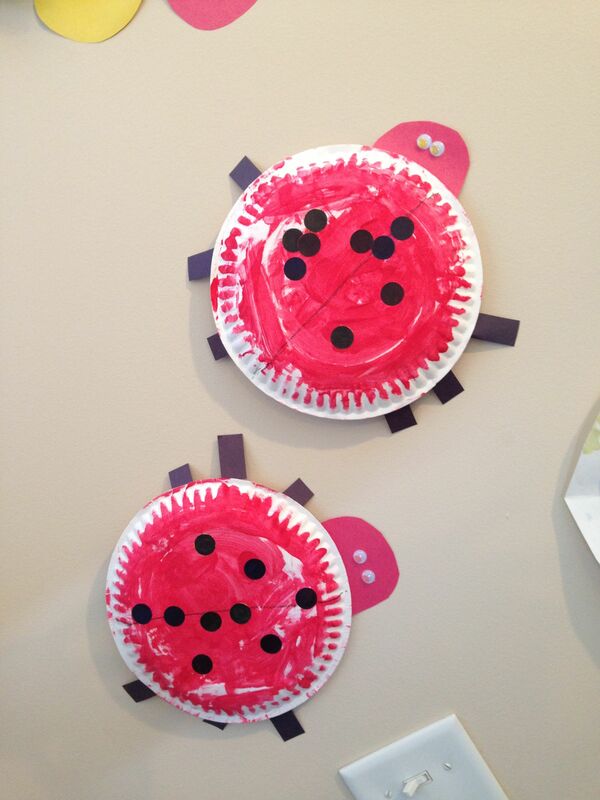 Toddlers enjoy learning about all sorts of animals, including those that can be found at a zoo, or in a jungle. Here are some fun activities about wild animals. To the tune of Wheels on the Bus: “The lions at the zoo say roar roar roar, roar roar roar, roar roar roar. The lions at the zoo say roar roar roar all day long.” Repeat with any animal sound you want. As quiet as can be and…SNAP! As quiet as can be and SNAP! One little monkey says “Ha Ha! Missed Me! The funky spunky monkey climbed up the coconut tree. Down came a coconut and bopped him on the knee. Out came a lion a shaking his mighty mane. Along came his mama who hugged away the pain. And the funky spunky monkey climbed up the tree again. Build a Zoo: Take out blocks or Duplos and toy animals. Build a zoo with your child. Outdoor Play: Build a habitat for plastic animals with rocks, sticks, and plants. Pretend to be an Animal: Make cards or dice that have pictures of animals, or put plastic animals in a bag. The child rolls (or draws a toy from the bag). Then you both pretend to be that animal – moving like it or making the sound. Habitat Sorting: Put out plastic animals or pictures of animals, plus pictures of habitats. Talk with them about which animals live on farms, which live in jungles, in the ocean, or in the desert. Bead Snakes: Thread beads on pipe cleaners. Fold ends over. Optional: Add googly eyes. Paper Plate Snake: Decorate a plate, then cut it into a spiral snake. (see photo at top) Add eyes. Dear Zoo by Campbell. Fabulous lift the flap. “I wrote to the zoo to send me a pet…” See what they send! Good Night, Gorilla by Rathmann. A charming wordless book about a gorilla escaping its cage. Brown Bear, Brown Bear, What Do You See? or Polar Bear, Polar Bear What Do You Hear? by Carle. Great repeating rhyme and rhythm. Children love to predict what will be on the next page. Giraffes Can’t Dance by Andreae. A sweet story about everyone finding their special dance. 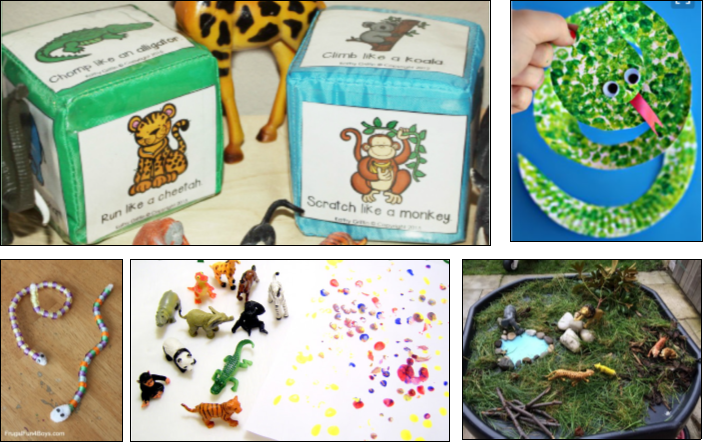 Here’s a handout version of these Jungle / Zoo themed toddler activities. 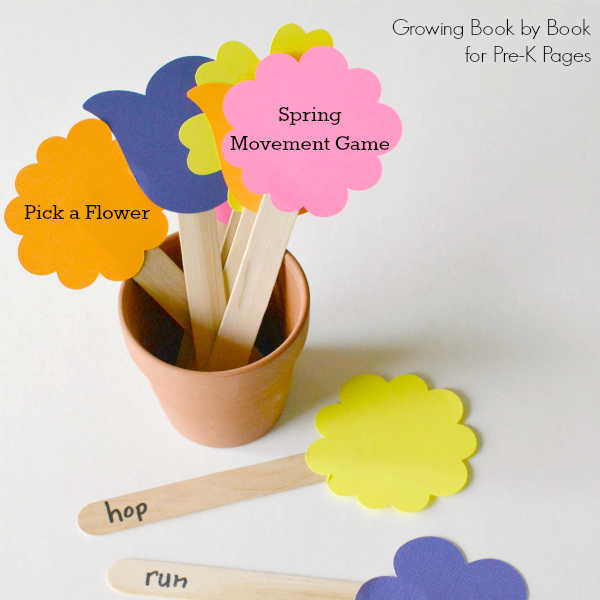 For more theme-based activities, check out the Fun with Toddlers series. This entry was posted in Fun with Toddlers series and tagged preschool, songs, toddlers, zoo theme on September 28, 2018 by Janelle Durham. 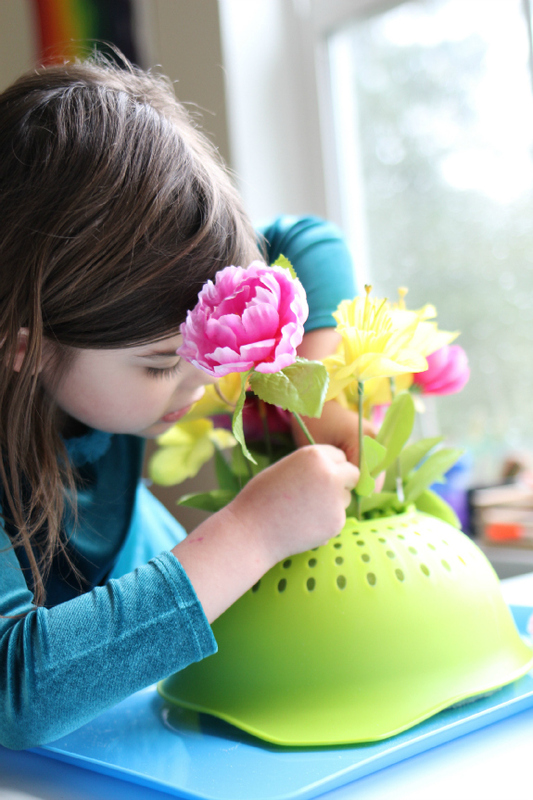 Learn all about sensory play in: The Ultimate Guide to Sensory Play. This entry was posted in Fun with Toddlers series on June 22, 2018 by Janelle Durham. 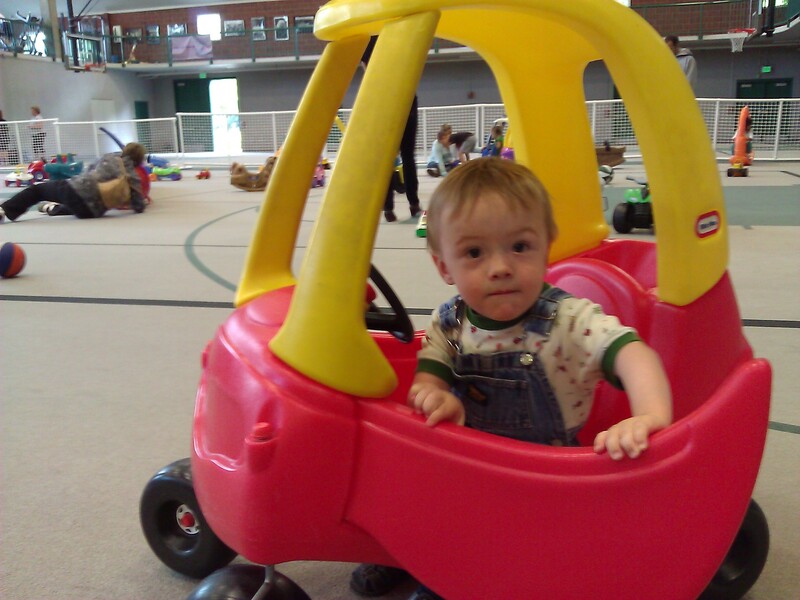 Try an indoor playground – lots of large motor play with new friends, out of the rain. Hike in the woods and have a nature scavenger hunt to see what you can find. Find a construction site and watch the work. Attend library story time – they’re free, happen at several locations each week, and are great for encouraging a love of reading. Go to the store – a hardware store, a grocery store, whatever – focus on sharing the experience with your child instead of on what you need to buy. Wander around a rock yard looking at big rocks, and collecting a few small pebbles to bring home. Watch the fish at the Seattle aquarium, or even just in the small aquarium at your local Chinese restaurant. Go to a dog walk, watching very happy pups is a great mood lifter. Check out a sushi restaurant with a conveyor belt – just watching the food go around is great entertainment! If you can find your plastic Easter eggs, you can pull them out for a fun hunt any day. For lots more ideas, for songs, books, games, and crafts you can do at home, check out my “Fun with Toddlers” series, which are all focused around a theme such as ducks, farm, winter, zoo, or moon and stars. Also, check out Inventors of Tomorrow, which is my blog focused on hands-on STEM activities for teaching kids about science. If you’d like someone else to do all the planning for enriching varied activities for your child (from music to art to big motor play), check out classes sponsored by the parent education programs at our local community colleges. Great play-based learning for kids from birth to age 7, and parent education and support for you! If you still need more ideas, then we have a fabulous resource here in Seattle. 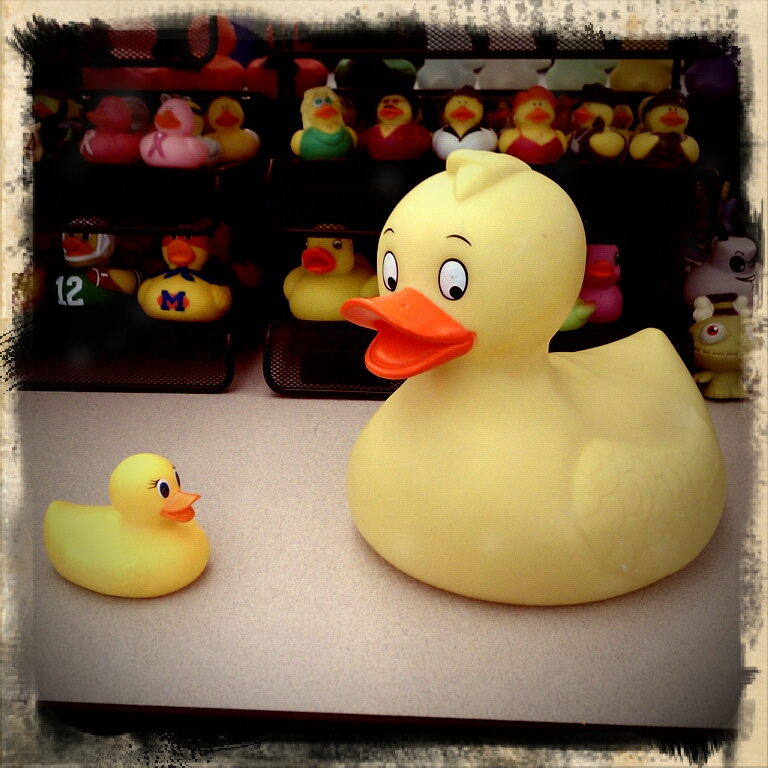 Check out parentmap.com for a never-ending supply of ideas for things to do with kids in the Puget Sound area. This entry was posted in Fun with Toddlers series, Play and Fun Activities, Seattle area and tagged cabin fever, fun, outings with kids, winter on December 30, 2016 by Janelle Durham. This month’s theme was Transportation: Boats, Planes, Trains, and Automobiles. Always a favorite theme, especially with the boys! Here are some ideas for transportation activities that toddlers and preschoolers love. Sorting Cars. Make cardboard garages (or use colored paper to make “parking spaces”) for your child’s cars. Encourage your child to sort the cars by color. Sorting into categories is a great foundational skill for later learning. Train Car Sort. Make colored train cars, or print a picture of a colorful train, and have your child sort objects by color into the right car. Draw a City. Use a big box your child can climb into, or flatten out a smaller box. Draw roads and buildings on it. They can drive cars around the roads. You can also build cardboard tunnels to drive through and bridges to go over. You could also try out PlayTape which is tape you stick to the floor which has an image of a road on it. Ramps. Take a flat piece of cardboard. Tilt it by propping on a piece of furniture. Race cars down it. Even better, put a tower of blocks at the bottom to crash the cars into. You can play with angles – the steeper the inclined plane, the faster the car goes. Magnet Car. Draw a road on a paper plate. Make a paper car with a magnet on it. Use a magnet wand under the paper plate to drive the car around. Bubble Popping Car: Tape bubble wrap to a table. They can drive a toy car or truck over it to pop the bubbles. This is a good strength builder as they have to press hard to pop. Taped Road Pretend Play: Use masking tape on the floor to mark out roads (or train tracks) wide enough that your child can crawl along them, pretending to be a car (or train). Add cardboard boxes for tunnels, garages, and more. 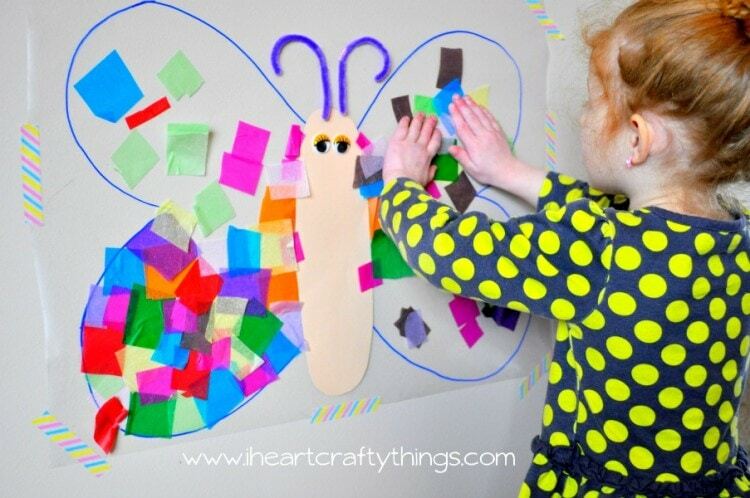 Toddler Approved has great pictures for this idea. Build a Cardboard Car and Have a Drive-In Movie: Use a box big enough for your child to sit in comfortably, and decorate it to look like a car. This can be very simple, or as complex a project as you want. Find the tutorial for making a cardboard car. Once the car project is complete, celebrate with a drive-in movie. Watch your favorite movie – you can sit on the couch, they sit in their car. Serve popcorn! Sponge Printed Trains: Use sponges to print colorful rectangles for train cars, then use a black dot marker for the wheels. See on Buggy and Buddy. Down by the station early in the morning. See the little puffer bellies all in a row. See the engine driver, pull his little lever. Puff puff! Toot toot! Off we go! Hurry, hurry! Drive the fire truck! Hurry, hurry! Drive the fire truck! Hurry, hurry! Drive the fire truck! Ding, ding, ding, ding, ding! Motorboat Activity: Do the song above, but have them walk when you say slow, jog when you say fast, run when you say step on the gas, and fall down on run out of gas. First I go forward, Then I go back. Red Light, Green Light. When you say green light, they can walk. When you say red light, they need to stop. (Advanced version: when you say yellow light, they can keep walking, but need to slow down.) This is a fun game, but also great safety training. When your child is headed out into the street, you say “red light” and they know to stop! Tire Tracks. Drive toy cars on play-dough to make tire tracks. Or, squirt paint on a big piece of paper, and drive cars around. Or, drive them in a sensory bin full of dried rice, grains, or beans. Bulldoze the Beans: Add toy bulldozers to a bin of beans. Car Wash: A tub of soapy water and some toy cars is lots of fun. Freight Train by Donald Crews. Teaches colors and names of train cars. My Car , Trucks , Planes, Boats, Machines at Work by Byron Barton. Don’t Let the Pigeon Drive the Bus. by Mo Willems. Very silly. Best for 3 years and up. 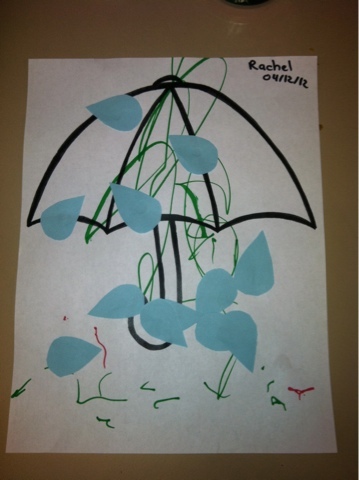 This entry was posted in Fun with Toddlers series, Play and Fun Activities and tagged cars, preschool, toddler, trains on February 26, 2015 by Janelle Durham.